Off-Season Watch: Canucks' top pick on the table? Each day through the NHL Draft on June 22 and up until free agency on July 1, TSN.ca breaks down the latest news and rumours around the NHL. The Vancouver Canucks' first-round pick, No. 7 overall, is fittingly listed at No. 7 on the TSN Trade Bait board. TSN Hockey Insider Bob McKenzie noted Monday that the Canucks have been linked to veterans who would command a first-round pick on the trade market, but he believes the team would be best served continuing to build on their stable of prospects. "Well, I think all the indications are that veteran players that are available for trade are being looked at by the Vancouver Canucks,” McKenzie told TSN Radio 1260 in Edmonton. “So Ryan O’Reilly, for example, in Buffalo is a centre that the Canucks may have some interest in. I don’t know if they’re prepared to give up the seventh pick as part of that; but if Ryan O’Reilly is getting traded that’s the type of package the Buffalo Sabres are going to expect to get back, is somebody’s first-round pick. If the Carolina Hurricanes decide to trade Noah Hanifin, a relatively young defenceman who’s coming out of entry-level, they’re going to expect to get a first-round pick back. 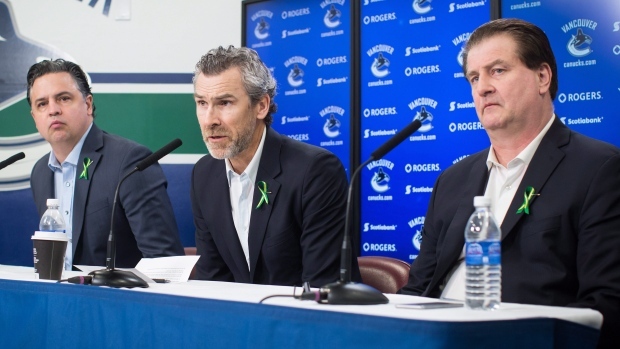 “And I’m with you: If I were the Vancouver Canucks as a quasi-rebuilding hockey team, and I realize that they’re a couple of years into it and they’ve got some good players coming. They’ve got (Elias) Pettersson coming, they’ve got (Adam) Gaudette coming, they obviously have (Brock) Boeser in their lineup. They’ve been filtering in some real good young players, and (Bo) Horvat is not old by any stretch. So they’re starting to put together a nice nucleus of young players. I would still want to continue to add to that. “And I think this year’s draft - when you’re picking seventh in the draft, you’re going to get one of the premier guys. And when I say premier, obviously not Rasmus Dahlin at the top. But the consensus seems to be that this draft is probably about eight, nine or 10 - somewhere around there there’s a little bit of a cut-off point between that group and everybody else. So if you’re in that group and you’ve got an opportunity to get one of those guys, I think you would want to seize that opportunity - that’s how I would do it. The Canucks, who have missed the playoffs in each of the past three seasons, led all teams with five players on TSN Director of Scouting Craig Button's list of the top 50 NHL-affiliated prospects in February, including Petterson who was listed at No. 1. TSN's Ryan Rishaug noted Monday that the Edmonton Oilers might not find it as difficult as some might think to rid themselves of Milan Lucic, but argued the team shouldn't rush to move him after one bad season. Rishaug listed the increasing salary cap, the success of power forwards in this year's playoffs, the likelihood of a bounce back season and the fact Lucic has succesfully protected Connor McDavid over the past two seasons as reasons teams will have interest this off-season. TSN's Ryan Rishaug joined his new best friend Dustin Nielson where they pour over the recent Milan Lucic trade rumours. He argued, however, that the Oilers are already in need of wingers and Lucic could still be valuable to the team if he can return to his old form. The only reason he could see for the Oilers shipping him out would be to free up cap space for the addition of a big name defenceman. TSN Hockey Insider Darren Dreger agreed with Rishaug that Lucic will garner interest, but noted a trade involving the winger would be tough to pull off. “Well, it’s a complicated one obviously given the length of the contract,” Dreger told TSN Radio 1260 in Edmonton later on Monday. “The worry, I suppose, from some that Milan Lucic can’t deliver in the capacity that he has historically. He’s not coming off a very solid year, but there’s interest in this player. I’ve spent enough time on this file over the last several days, I would say, to at least acknowledge that there’s interest in Milan Lucic. “So I suspect that any team that’s interested, as Ryan Rishaug was kind of poking at on Twitter earlier today, that’s a team that is intrigued by what Ryan Reaves brought to the Vegas Golden Knights. So there’s a deterrent quality that a team most motivated would have an interest in. Lucic, 30, finished the season with 10 goals and 34 points and 80 penalty minutes. As noted in Sunday's Off-Season Watch, San Jose Sharks defenceman Paul Martin is a likely candidate to be bought out when the window to do so opens on Friday. Martin, who played in just 14 games last season, has one year and $4.25 million left on his contract, meaning his buyout would save the Sharks $2.8 million this year, but cost them $1.42 million next year. Jared Clinton of The Hockey News speculated on five other players who could also face buyouts when the window opens - Calgary Flames forward Troy Brouwer, Tampa Bay Lightning defenceman Brayden Coburn, Tyler Ennis of the Minnesota Wild, Jori Lehtera of the Philadelphia Flyers and Washington Capitals blueliner Brooks Orpik. Clinton belives Brouwer is "a no-brainer buyout" for the Flames after posting just 22 points this past season. He's due $9 million over the next two seasons and would save the Flames $3 million in each of the next two years, before costing them $1.5 million for the next two seasons. Buying out Coburn and Ennis would save two teams in need of cap space for restricted free agents right now, Clinton writes. As for Lehtera, he believes the Flyers could use the money towards luring free agents this summer, though general manager Ron Hextall said last month he planned to keep Lehtera for the final year of his deal. Orpik was fifth in average ice time among Capitals defenceman during their run to the Stanley Cup and Clinton argues the Capitals could use the $3 million in cap space he'd free up to try to retain fellow blueliners John Carlson and Michal Kempny. The buyout would cost the Capitals $1.5 million in 2019-20.